As a kid I loved the library, I was a book a day kid. I didn't really care what it was, as long as it was interesting in some way and over 300 pages. I never understood picture books as the picture created in your own mind was the fun of it. I still own a decent science fiction collection from the 50's and 60's. but.. I think the school teacher librarian and the idea of a library itself is on its last legs. The non fiction section completely lacks relevance (it always was too small to be useful) and has been surpassed by online resources or class based texts. The day of the printed book, even fiction, is passing. I realised this when I watched my wife prefer to read her book on a backlit iPad than the paper copy next to her. Specialist research tasks are no longer the domain of the librarian. 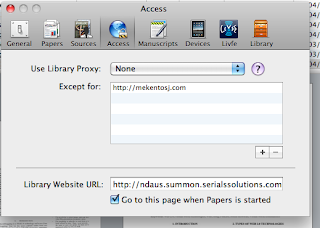 There's no reason why a bibliography by a student can't be written using a tool like 'Papers' - it's a task now that does not need a specialist teacher. There's no reason why a teacher can't prepare a list of articles for students to research from and keep for later use - I've never seen this done by a librarian anyway (albeit it was more common with paper books). 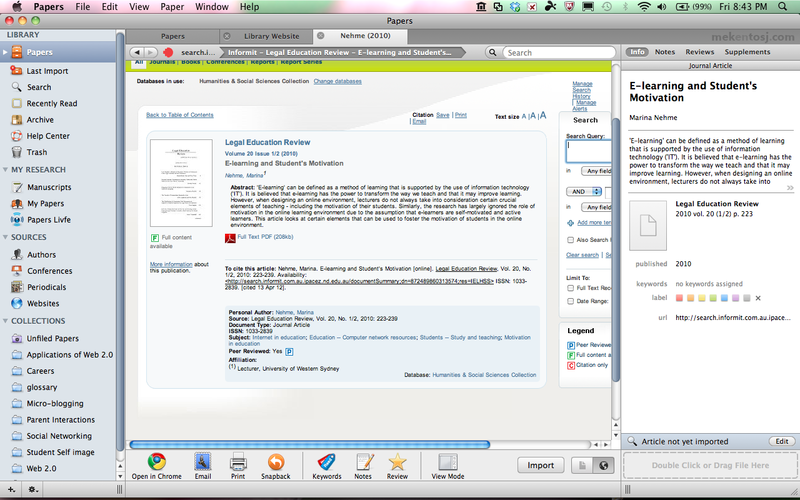 Electronic documents can be annotated and highlighted just like paper - without printing and photocopying time/expense. Students with laptops are ringing the death knell of the library being IT centres, distributed computers in classrooms are just more useful. When I look at a library I see a shell of the learning centre it once was. I see broken computer labs with kids playing games, too loud to promote study. I see old mouldy books last read in a previous decade. I see old brown furniture that wasn't even that well made to begin, not old enough to be retro, not new enough to be modern. Libraries could become study centres again with the right management in place. Librarians though are too expensive to use managing study centres. Once a fertile ground for breeding librarians, now that paper books are becoming extinct, so are librarians. The person choosing, storing and sorting books has been overtaken by digital resources selected by the masses or distant experts. Where does this leave the librarian? Sadly, I'd suggest out of a job. I can't see such traditionalists re-inventing themselves into something as required as the librarian was. After writing my last article on using Papers I thought to myself, I need to write a glossary of terms at some point, maybe Papers can help. 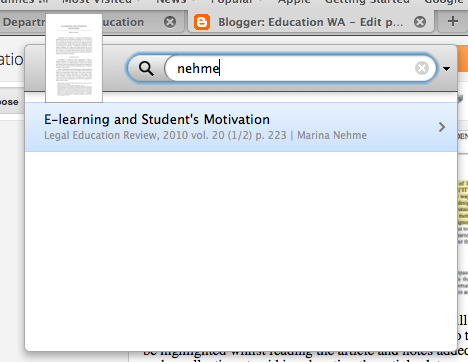 If I use the search function in Papers, I can search for the term and view how other authors have interpreted them. In searching for the glossary item I discovered a table that I had missed and thought may be useful later in defining what microblogging was and why microblogging was important from Halse (2009). Both came from conferences, indicating that completed formal research may be still coming and that microblogging is a relatively new phenomenon. 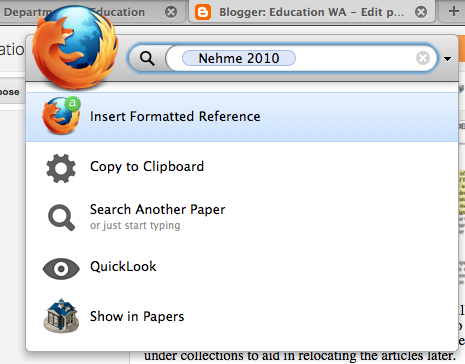 Quite a cool use of the search function, something that would have taken ages trolling through multiple pdf files or rewriting from sticky notes attached to paper. I will need to look further into why ellipses are turning up in reference lists though. Costa, C., Beham, G., Reinhardt, W., & al, E. (2008). Microblogging in technology enhanced learning: A use-case inspection of ppe summer school 2008. Proceedings of the …. Halse, M. L., & Mallinson, B. J. (2009). 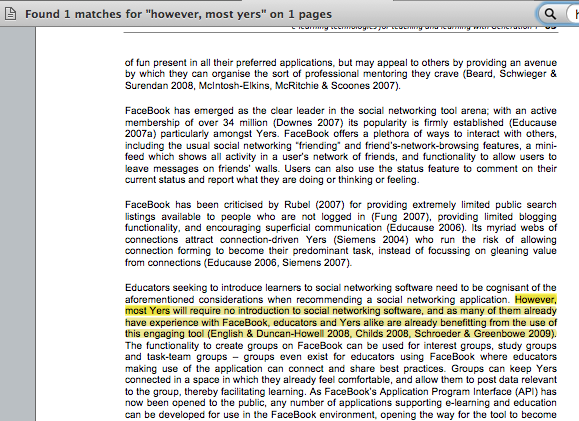 Investigating popular Internet applications as supporting e-learning technologies for teaching and learning with Generation Y. International Journal of Education & Development using Information & Communication Technology, 5(5), 58–71. University of the West Indies. Holotescu, C., & al, E. (2009). 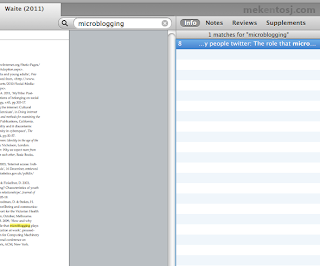 Using microblogging in education. Case Study: Cirip. ro. 6th International Conference on e- …. Here's something I do a lot. 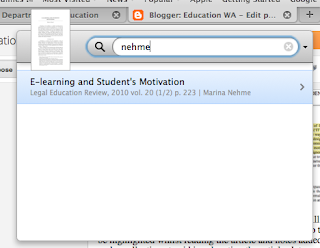 I'll read an article, quote it in a document and then forget where I quoted it from. Then I'll have a rummage, fail to find the document and have to remove the quote, undermining the argument I was trying to build.
" However, most Yers ...". 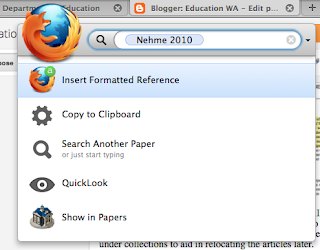 I selected "Papers" at the top of the left hand pane to bring up all articles. 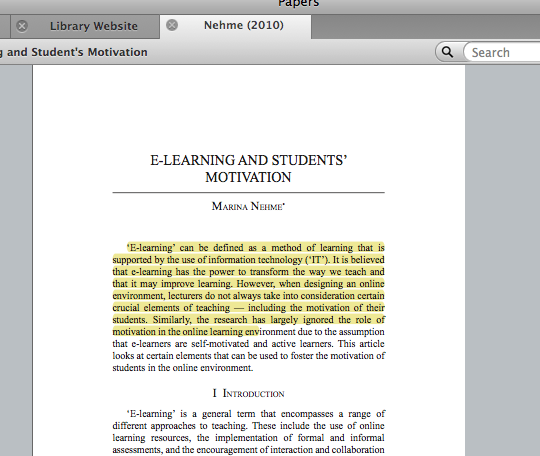 I was then able to click on the document and find the quote that I had highlighted previously. This may sound like a trivial task but I can see that this would also be very useful when checking the validity of quotes when proofing a document. Papers collections can be a bit confusing at first, but once you figure it out, finding articles is considerably easier, especially when you are reading 50-60 papers a week preparing for a literature review. To add an article to a collection, drag it from the main pane to the collection. Once filed it will disappear from the "Unfiled Papers" collection. 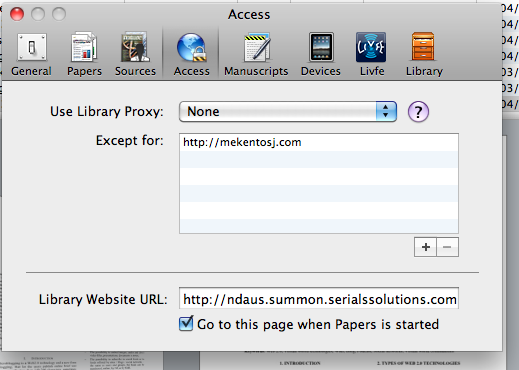 If you make a sub collection (a collection in a collection) articles will be automatically added to parent collections. I found splitting Case studies and Editorials handy, since case studies typically have more depth (useful for a literature review) and reviews/editorials are wider reaching (useful to get a big picture look at where research trends are developing). 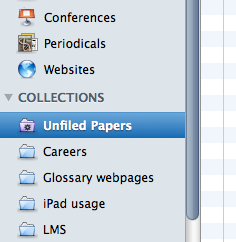 If you delete an article from a collection, it will again appear in "Unfiled papers". 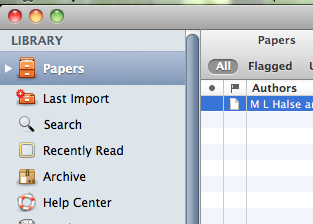 If you delete an article from "Unfiled papers" it will be moved to Trash. 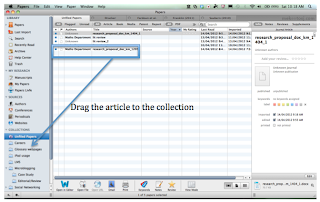 If you move an article directly to Trash, it will be deleted from all collections (but can be restored from the Trash). If you delete a file from Trash it is permanently deleted. This can all be disorientating at first (with articles appearing all over the place), but once figured out, it is quite useful. 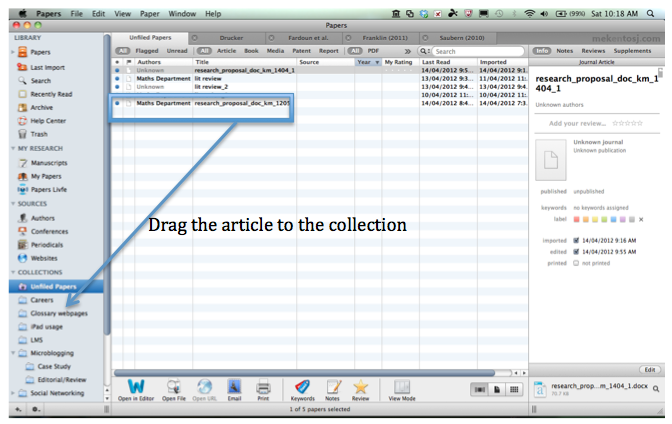 A useful tip when wanting to move a file between collections is to delete an article from a collection and then add it to the desired collection from "Unfiled papers". 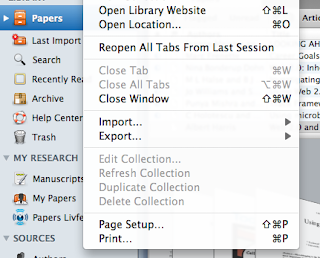 This will save you from having multiple copies of the same paper in different collections (but takes a bit of courage the first time). 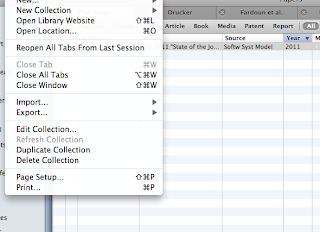 Another interesting feature is the detection of duplicates. If you download the same file twice, Papers detects it and prompts you to delete it. 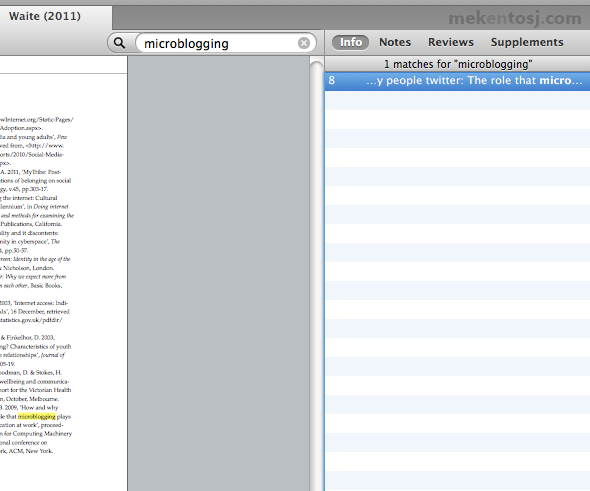 The indicator is on the far right hand side near the bottom when looking at an article or in the main pane on the left hand side column. This is the year of web 2.0 usage in the classroom. Teachers have avoided using technology in the classroom and have stated that the failures in the past is a justification for not using it in the future. I'll put my hand up and say that I was one of those. 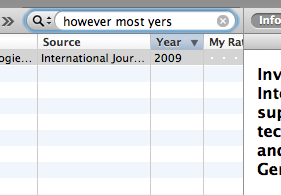 Then I did a host of research for my "on again" masters. I think the time has come that we give this a good look. 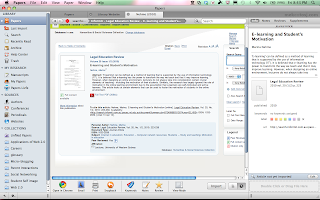 The failure of learning management systems (LMS's) can now be overcome. 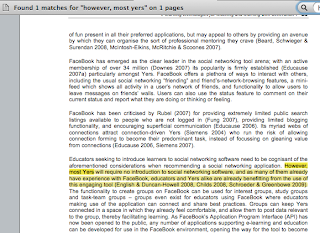 Social media applications provide the gloss that engages students online. It gives them reason to revisit and get access to information that they require at critical times during their "learning journey" (bleuch.. writing that leaves a bad taste in my mouth - but best describes what I mean). Online applications are now reaching the level that they can be useful in the classroom and superior to direct instruction. There is enough competition that application vendors are willing to listen to classroom requirements, assist teachers with implementation and work towards a successful implementation (rather than an "overstate the possibilities, take my money, dissappear" approach. I'm sure this sounds familiar to many of us). Web 2.0 extends the classroom beyond four walls - blogging, microblogging, social networking, cloud computing are being used effectively in higher education and there is little reason it shouldn't be used in primary and secondary settings. Not doing so causes equity issues for our students when they enter higher education. 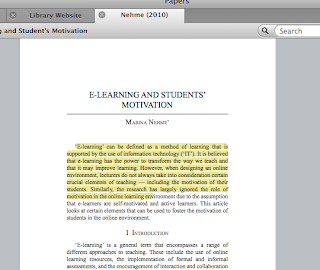 Students are now IT literate in ways that can be useful to implement in the classroom. We're not teaching mail merging, Excel and Access usage anymore. We're talking small bites of IT understanding and using it to directly aid classroom progress. Microblogging (short notes sequentially placed on a wall similar to facebook) attaching IWB notes for revision, getting a better idea of progress through online marksbooks, providing tools for online collaboration and creating active subgroups within a class, shared development of documents through googledocs, improved organisation through calendars, online project submission, annotation reducing paper usage, creating digital rather than paper notes using applications such as notability or goodnotes, classroom monitoring software, vod and podcasting - these sorts of things take small amounts of time to implement, are typically free and can make real differences in results, it's now accessible, cheap and works. These things can be done now, not tomorrow, enabled by tablet and 1-1 laptop access. I'm not glossing over the learning curve for us, or the overhead of starting the progress but.. if it can clearly be shown that these techniques are superior, it is worth the effort. I think this time has come. Even in Math, technologies are starting to mature that reduce IT overheads and improve the classroom experience especially in revision, organisation and note taking. It's time that schools and universities embrace what can be done to improve teaching pedagogy where new technologies drive student performance. Perhaps we could give less prominance to engagement and self esteem. These two come primarily as a result of performance and to get engagement with web 2.0 in a class, I think it has to be shown that performance is the primary result. 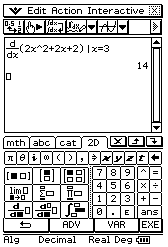 There are a host of ways to find the first derivative on the CAS calculator and to solve calculus problems quickly. 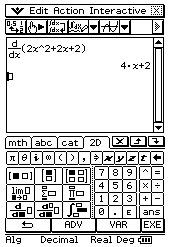 Sometimes I think exam writers are well behind what these calculators can do and fail to understand how trivial some problems have become. Let's now find x if we know y. This is a little harder as we have to solve the equation. 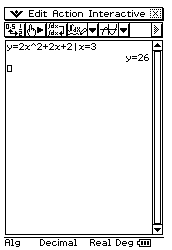 Note that I removed the "y=" this time. I differentiated the expression on purpose as it makes the next part easier. Finding the 1st derivative/gradient/instantaneous rate of change at a point is also easy. Last but not least we can find a point for a particular gradient. It's very much a case of thinking what you need and then finding it. 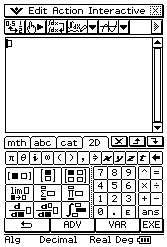 As you can see it can all be done with one line on a CAS calculator, things that would take multiple steps on paper. 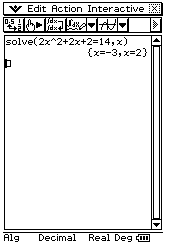 TanLine is also a useful function that can be investigated and used to quickly find tangents.